Golf writer and course designer extraordinaire Pat Ruddy was in fine form at the recent Irish Golf Writers’ Association annual Championship at magnificent Woodbrook Golf Club. It wasn’t that the creator of The European Club landed the Mary McKenna Trophy as the top dog amongst the scribes at this year’s Tipperary Crystal sponsored event but the presence of so many of his creations or renovations in the latest Golf Monthly course rankings clearly added a spring to his step. No fewer than 19 Irish courses made the magazine’s list of the Top-100 Courses in Great Britain and Ireland with The European Club at No 20 behind Royal County Down (No 2), Royal Portrush (No 11), Waterville (No 15) and Ballybunion Old (No 16) but ahead of venerable Portmarnock (No 25) and Lahinch (No 26). Of the best new builds since 1980, The European Club was second behind Trump Aberdeen with Ruddy’s Sandy Hills Links at Rosapenna at No 7 and his co-designs with the late Tom Craddock also well regarded with Ballyliffin’s Glashedy Course at No 10 and Druids Glen in Co Wicklow, No 12. Adare Manor, Ardglass, Ballybunion (Cashen), Ballyliffin (Old), Carton House (Montgomerie), Castlerock, Concra Wood, Donegal, Enniscrone, Headfort (New), Killarney (Killeen), Killeen Castle, Portnoo, Portsalon, Portstewart. Seamus Power might be heading for the Web.com Tour in the US but there's another star rising at West Waterford. Seventeen year old Eoin Conway shot a super round of 68 gross to win the South East Senior Alliance event at Rosslare Golf Club recently. ccording to our sources down south, Eoin has had a great year, winning all his matchplay matches in Junior Cup and Fred Daly Trophy. Looks like a young gun to keep an eye out for in 2015. Pat Ruddy is busy carrying out major courses improvements at County Sligo and while there's some GUR to deal with, the work has unearthed some historical artefacts. Old balls aren't usually worth much but this find looks interesting. We await a full report from the west! e didn't win The Invitational Pro-Am at Finca Cortesin on Sunday but Trim's Ciaran Boggan still walked away with just over €1,500 for finishing fifth on his professional debut. Cañizares, the 40-year-old elder brother of European Tour professional Alejandro Canizares, claimed the €10,000 top prize but Boggan can hold his head high after beating the likes of experience campaigners Bill Longmuir, Carlos Rodiles, Juan Quiros and Ballyliffin's Brendan McCarroll, who was 29th. Royal County Down has been ranked No 1 in Golf World's latest ranking of the Top-100 courses in Great Britain and Ireland. 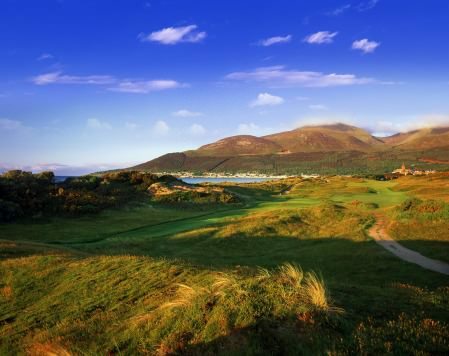 Royal County Down - still No 1Ranking lists always lead to vigorous debate but you can be sure that Golf Digest Ireland’s “Volvo Top-100 Ranked Irish Golf Courses” will not be getting pride of place at Royal Dublin any time soon.